If life didn’t challenge us, how could we know how strong we are? This book is definitely not my regular reading, but after I read a few excerpts from this book, I realized that I could relate to some of the situations and wanted to read the entire book. Putting The Pieces Together isn’t a regular self help book, but a book with messages from people who have been in different situations and how they managed to put the pieces of their lives back together. It's a great inspirational book. It doesn’t give advice, but features essay like life stories and lessons learned from twenty six authors. Each author shares a unique story with topics like finding one’s self, life after divorce, handling death, and other ever day occurrences. I give this book four flowers of love. If you need a pick me up when life puts you down, you will want to read this book. It’s full of real life situations that anyone can relate to and make offer insight on how to deal with them without giving up. I'm giving away my copy of this inspirational book. Just leave a comment with your email addy to be entered. Please read the contest and giveaway rules before entering. Contest ends Nov 8. Winner will be randomly selected, emailed and will have 72 hours to respond before another winner is selected. This sounds like a very good book to read. I am sure it has several life's experiences for everyone to relate to. This book sounds awesome. Thanks for the giveaway. 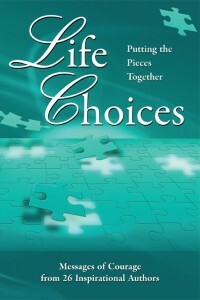 Life Choices: Putting the Pieces Together is a book of true short stories. While the stories are really good and interesting reading, the authors that wrote the stories are successful, fascinating, quality people. It has been my pleasure to work with them. Thanks for the giveaway! Sounds like my kind of book.